As health plans ramp up population health screening programs to close gaps in care for HEDIS 2016, special attention should be paid to preparing members for these initiatives. When members know what to expect and how they can prepare for an assessment, the process can be less stressful for them and the likelihood for compliance is increased. Sometimes health risk assessments can be overwhelming for members, especially when they don’t understand the process. Here are some tips to share with your members ahead of their appointment to help them prepare some of the things the examiner will need to know. The goal of MediCheck™ is to assist health plans with the data collection necessary to identify risks, and ultimately provide a plan for members to manage their health. 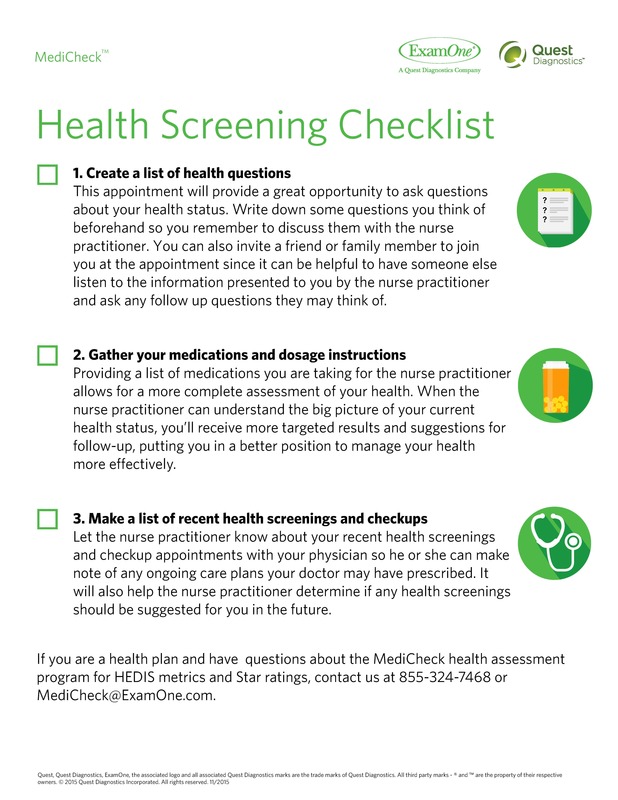 Whether the health risk assessment process uncovers new information or reinforces the existing recommendations of the member’s physician, the documentation of those conditions, along with the face-to-face coaching, can help ensure that health plans are not only HEDIS-ready, but also actively supporting member health. Talk with a MediCheck representative today to learn how our health risk assessment program can help your health plan engage more members with their own health.